Toby is 1 year old and full of energy. In fact, this picture is rare. He is usually moving too fast to photograph. 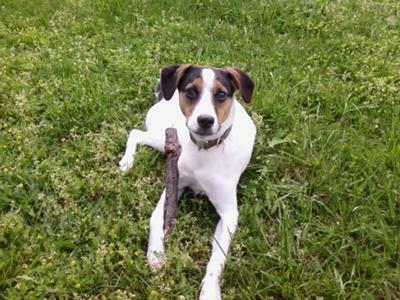 Like most dogs, he loves to chew on things, and a stick is his favorite outside toy. He has many many nicknames including: Tobster, Tobias, Toby-wan-kanobi, and Toblerone. Although, he is often mischievous, my husband and I wouldn't know what to do without Toby. He truly completes our family! !